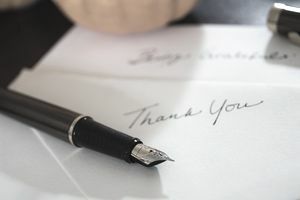 Writing thank-you notes can be an onerous task, even when you're writing to thank a hiring manager for extending a job offer. When you're writing to thank people for their time after you didn't get the job—well, it's understandable if you're not feeling enthusiastic about this particular chore. But here's something that might change your perspective: A thank-you note after a job rejection is not just a thank-you note. It's also a stealth mission. By showing good grace and employing a little bit of skill, you can use your thank-you letter as a way to build your network, create a path to future job opportunities, even get a free critique on your interviewing skills and candidacy. This is an example of a thank-you letter for when you didn't get the job. Download the thank-you letter template (compatible with Google Docs and Word Online) or see below for more examples. I truly enjoyed meeting with you and discussing the position of assistant manager at XYZ Corp. I wanted to thank you for taking the time to tell me about the job and the company and for spending part of a busy afternoon showing me around. While of course I was disappointed to learn that you'd be moving forward with another candidate, I appreciated the chance to speak with you and learn more about what XYZ will be doing in the coming year. I was especially interested in the ABC project and how it will affect the marketplace. As a big fan of XYZ, I'll be watching the rollout with interest. I hope that you'll keep me in mind for future opportunities, as I know XYZ is growing. I'd love the chance to put my skills to work for an organization that I admire. Be specific about the things you're thanking them for: their time, yes, but also the information they provided, especially if you're excited about it, and any special steps they took to make your interview worthwhile, including an office tour or a business lunch, for example. Finally, offer an opportunity for follow-up by asking to be considered for future positions. Just because this particular position wasn't a good fit for you today doesn't mean there won't be something even better available tomorrow. If you're gracious in your thank-you letter, you could be first in line for that new role. Optionally, you can also ask for feedback with questions like "Did you identify any key qualifications for this job which were missing in my background?" Just don't be surprised if the hiring manager doesn't respond or doesn't provide an in-depth answer. There might not be a specific reason why another candidate was selected over you, and even if there was, the interviewer might not feel comfortable delivering criticism. If so, that's their problem, not yours. As always, your communication should be proofread, accurately spelled and punctuated, and error-free. Double-check the names and spellings of the people, companies, and products involved. Nothing is less impressive than a thank-you letter that misspells the name of the recipient or organization. Take care to render corporate names accurately as well. If the company spells its products' names in all-lowercase letters or with a random capital in the middle, they'll expect a savvy interviewee to do the same.